Howdy and welcome to today's post. 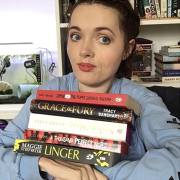 I've been meaning to write this post for quite a while but you know how it is, my blogging schedule basically has a life of it's own and I'm never really quite sure what I'm going to post or when. Anyway! 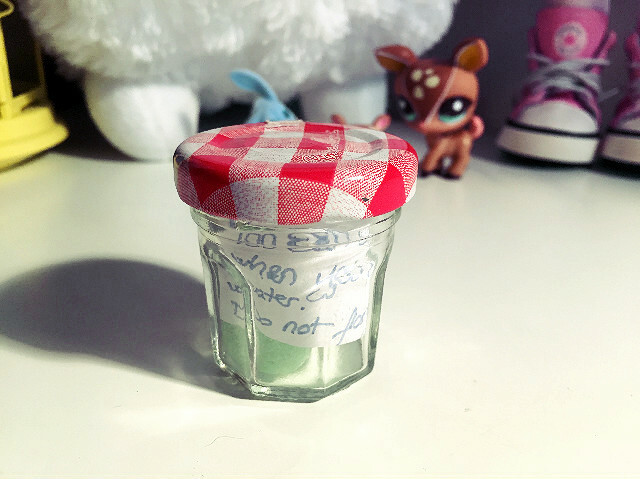 Here I am, finally introducing you to Moe the Marimo. 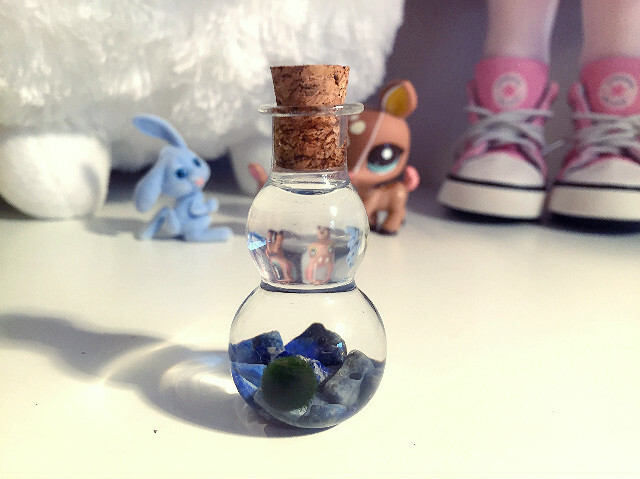 For those of you that aren't familar, marimo are essentially a rare growth form of algae that grows into large balls at the bottom of a number of lakes. They have a soft green velvety appearance. Marimo are popular in Japan and are even a protected species and considered a national treasure. 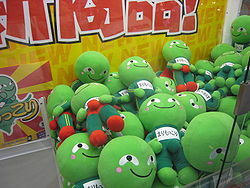 They are also brought to life in anthropomorphic form as the soft toy character, Marimokkori. Aside from Japan they are also known to form in Iceland, Scotland, Estonia and now Australia. While some people keep them for their aquarium tanks, others - like me - keep them just because they look cute, are low maintenance and make a nice desk decoration. Marimo come in many different sizes and the size you go for will depend on it's purpose and how you plan to display it. 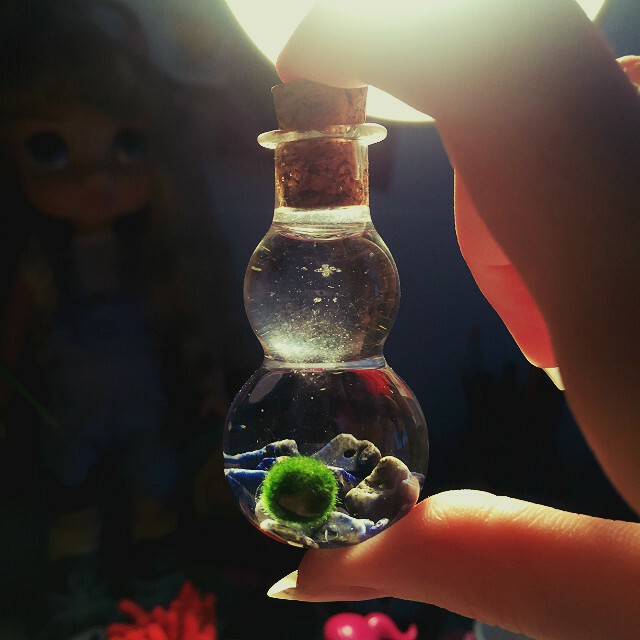 While your marimo will grow, they are said to only grow at a rate of about 5mm a year. So you're not going to have to worry about upgrading their home too often if like me you want to keep them in something relatively small on your desk. So on to the story of mine! I first seen marimo on Instagram. Someone had taken a photo of theirs in a little IKEA jar with pink micro beads in the bottom. It just looked so pretty, I was intrigued right away. I did some Googling and learned about them and I just had to have one. I checked on Ebay and there was a seller (who I don't have a link for, sorry!) 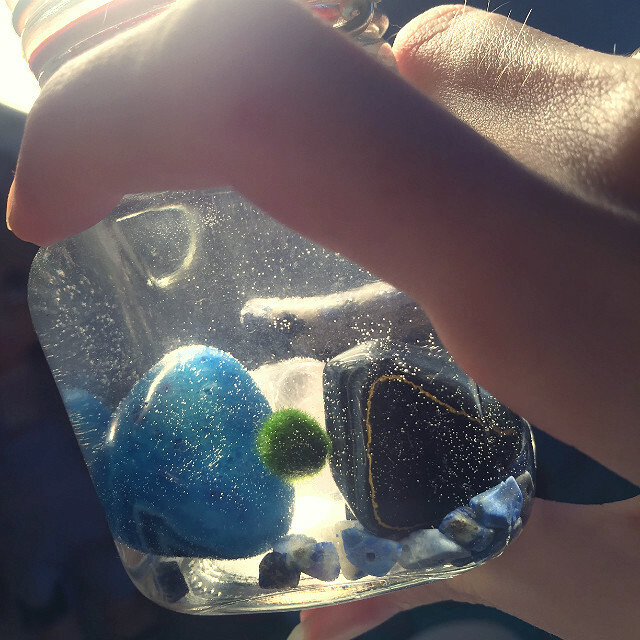 selling them in cool little jars with a choice of stones and shells in the bottom. Naturally I went for the one with lapis lazuli in the bottom as it's my favourite stone. I have a necklace and a ring with it. If you are a fan of The Vampire Diaries, you're probably familiar with it. I'm sorry I don't quite remember how much it cost but I think with postage it was within the region of £13. A little more than I wanted to pay but they're just not as popular in the UK as small decorations as opposed to for aquariums. Naturally I treated myself to it none the less. As I said, it came in this little jar, complete with lapis lazuli stones in the bottom and a cork plug on top. 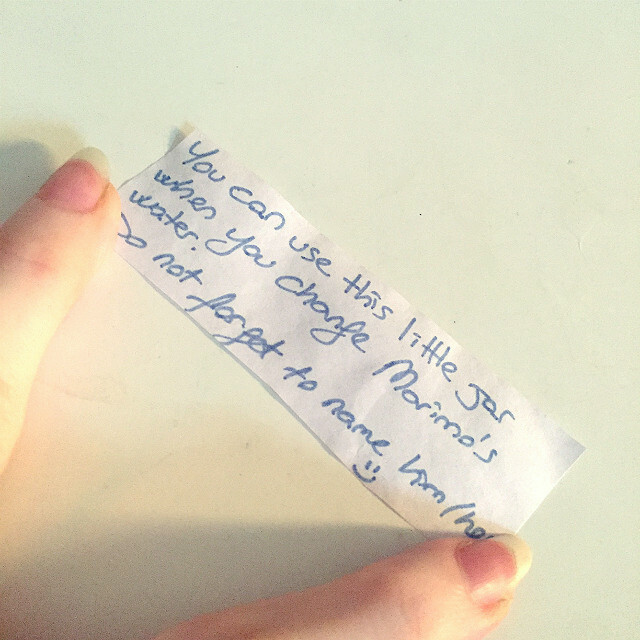 Along with that the seller sent me a little mini jam pot with a note inside. I thought that was a really nice touch and it also does come in handy during water changes. I'm always worried I'll lose Moe down the drain. The marimo's water needs changed around once a week. As they're from the bottom of lakes it's important you don't keep them anywhere that gets too much light and you can also roll it in your hand lightly to make sure it keeps it's shape and also pick any bits of dirt or lint it might pick up. It's just good to give it a little inspection every once and a while to make sure nothing has changed drastically with it's appearance. That's basically the extent of their maintenance. As easy as they are to keep, like any living thing, problems can still arise. Although it's more in relation to marimo kept in aquariums I feel like this is a good fact sheet to consult about care and problems. Here is a link. 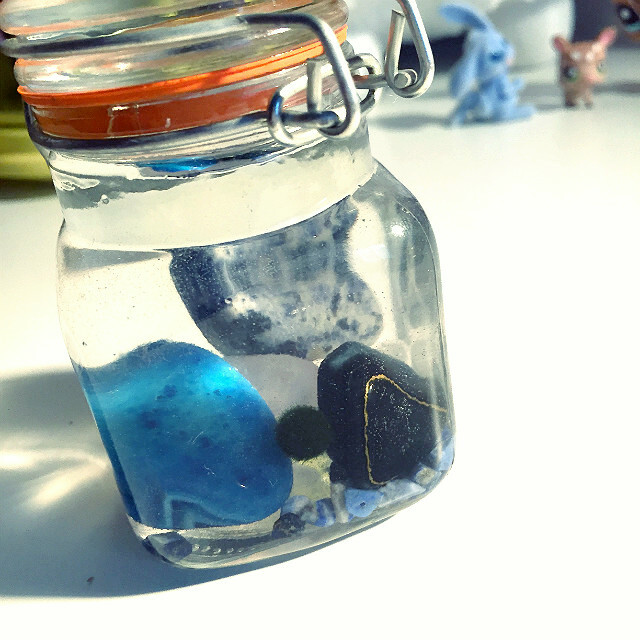 I really loved the little jar that my marimo came in but I had this slightly bigger jar lying around, as well as some healing crystals that I had bought but had little idea where to display them. So I decided to move Moe into the bigger jar with the healing crystals. The original jar was prone to getting knocked over easily and I feel like this one is just a lot safer. It's also easier to get Moe in and out for water changes as the neck of the original one was just big enough to get him in and out. I'm really liking this display so far but I plan to change it up every once in a while. I'd like to perhaps add shells at some point, perhaps some beach glass and then also maybe micro beads at some point. The possibilities are endless! Maybe I'll even try and get a little mermaid toy or some sea creatures. I'm sure I'll keep you all updated! What would you call your marimo? Moe is so adorable! I feel like I need 10 on my desk. When you change the water, does it smell or have a weird texture like with fish water? Ahh that's so cute! (I don't know when the last time I said algae was cute, but i'm just going with it...). It's such a neat little thing to have on our desk and watch grow. Plus, like you say, the ideas for the home are endless, I'm thinking themed homes for the holidays!